Just to let anyone know who reads my stuff that I have a new short story out. It’s called Judge a Book by its Cover. Unusually for me its a contemporary fantasy story – I tend to base most of my writing either in the historical past or a fantasy world. I feel its kind of on the edge between fantasy and horror – that’s sort of the theme of the story. Anyway, here’s the blurb and how to get it. You can read a brief extract from it here. A creative writing student wonders what the difference is between two genres of fiction: horror and fantasy. Like his new girlfriend says: “Perhaps it’s like the difference between pizza and a grilled cheese sandwich?” But when he asks his tutor the answer he gets leads to a truer definition of “Horror” than he ever expected. 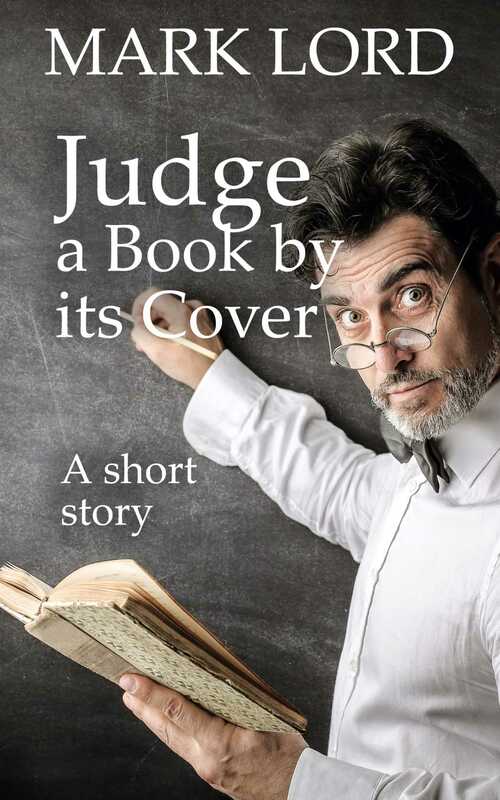 Judge a Book by its Cover is a fantasy/horror short story. You can buy Judge a Book by its Cover in eBook format from the following retailers and several others to numerous to list! I am currently writing a new novel set in the Hundred Years War called Stonehearted. As the novel is progressing quite well I thought it would be fun to release it in serial format every month or two. There should be four or five parts in total, each ranging from 15,000 to 20,000 words. I will then release the full novel once the last part has been finished. By The Sword’s Edge is the first part and I have made it free for the moment to introduce new readers to the series. You can currently download it for free from Smashwords. After a decade of peace England is again at war with France. But England’s warrior king, Edward III, is not the man he was. Ageing and turned to a life of pleasure, he will not lead an army into France again. And his eldest son, the famous Black Prince, suffers from a chronic illness while he tries to hold onto his principality of Aquitaine. Many men in England have grown rich from war and some, like Sir Robert Knolles, have risen from the lowest ranks to lead great armies, and he will now lead a force into northern France to challenge the French to battle. But first he has a visit to make to a Norfolk manor to visit an old friend. In By The Sword’s Edge two young people are thrust into the harsh realities of war. Richard Stone is a knight in training and son of a rich Norfolk merchant. Their neighbours are the d’Aubrays, who hold Sarbrook castle, but have sold or rent much of their land since falling into poverty. The lord of Sarbrook is missing in France, captured many years ago and not returned despite the payment of ransom. His daughter, Eolande d’Aubray is desperate for her father to return. Only he, it seems, can save her from the prospect of an unwanted marriage. Daphne who runs Tanzanite’s Castle Full of Books has kindly allowed me to write a guest post for her blog about Chivalry: A Jake Savage Adventure. In the post I ramble on about how I came to write Chivalry, the background for the story and some of the important themes: Arthurian romance, the terrible generalship of John of Gaunt etc. You can even sign up to win a free copy of the eBook! Mark Lord gives a very intense and painstakingly depiction of the horrors of war. The setting is an unexpected one and the supernatural sparkle intensifies the atmosphere a lot. The pacing is excellent and Mark Lord does not waste a word too much. The end is a tricky one. It is not an expected one and it delivers not the 100% solution. But it is as satisfying as the story itself. I hope there will be more Jake Savage stories (a full novel would be great) soon. Chivalry: A Jake Savage Adventure satisfied my craving for historical fiction with a mystery touch which is taking a greater part within my reading comfort zone of epic fantasy, steampunk and space opera. I have published my short story Chivalry: A Jake Savage Adventure as an eBook via Amazon and Smashwords. The story tells of an incident in the early career of Jake Savage, one of the main characters from Hell has its Demons. For Jake War is Hell and not the chivalric adventure that he thought it would be. A single silent knight armoured in black plate defends a narrow bridge in the hills of Auvergne, blocking the path of a band of desperate English soldiers. On the bank defended by the knight is a pavilion where sits a French noble-woman, who taunts the English. Cold, wet and hungry, Jake and his comrades have seen a tower high in the hills beyond the bridge, which they hope will provide food, drink and shelter and even a little loot. But the knight and the lady prove more difficult opponents than they imagined. Magic mingles with the harsh realities of war in this medieval fantasy short story set during the Hundred Years War. Nothing moved on this side of the densely vegetated ravine, but they could see a strange sight on the far side. Not twenty paces away across the narrow wooden bridge was a colourful pavilion of alternating broad blue and red silk stripes, wet with the rain, but still of fine appearance. Under the pavilion’s entrance canopy sat a lady, also dressed in silks, with a conical headpiece and veil of fine gauze covering the dark hair that flowed down her neck to her shoulders. She was preoccupied with some sort of detail work in her hands, embroidery perhaps. But in front of her, blocking the far exit of the bridge, and dressed in dull black plate armour, stood a tall man-at-arms, in full jousting helm. He stood motionless with arms crossed in front of him. Behind him was a tethered warhorse, also black, and a rack of weapons: lance, swords, pole-arms, maces and axes. Neither the knight nor the lady gave any indication that they had seen the English soldiers. Jake shook his head, but as ordered readied his great longbow. Six feet of straining yew flexed and in a moment his iron tipped arrow shot across the clearing and over the ravine and hit the black armoured knight in the chest. All six arrows had hit the knight, yet he stood perfectly still. Sir Robert ignored her words and ordered his men to fire another volley. And again there was no effect. Arrows seemed to stick in the mail or bounce of the plate, but Jake could have sworn he saw his arrow go straight through a gap and out the other side. It was like a tale of Arthur’s knights, thought Jake, where both the hero and his opponent should fight for honour. He wondered if hunger was making him dream what was happening, but the cold, and the pain of his knotted stomach felt real enough. Available as an eBook via Amazon.com, Amazon.co.uk and Smashwords for just $0.99. I have now made “Bird Talk” available as an individual short story ebook if you’re interested in downloading this to whatever e-reading device you might use. The story is also available as part of Theaker’s Quarterly Fiction #33, but I thought I’d like to give readers of this blog an option to just get “Bird Talk” on its own. You can get it either via Smashwords, where you get half of it for free (the whole story is $0.99) or via Amazon’s Kindle Store, where I believe part of the story is free, and then again you pay $0.99, or a little more if there are local taxes to add on. It should also be available via Apple’s iBook Store. Here’s the opening scene to the story. I hope you enjoy it. Roger followed Constable Will as he pushed his heavy frame through the weeds that choked the muddy alley. The constable turned to whisper to Roger, “The bird-catcher said he delivered to number twelve didn’t he?” An unpleasant smell of stale alcohol and spicy sausage wafted from the constable’s mouth to lay siege to Roger’s nostrils. He tried to ignore the foul smell of the man’s breath. He disliked being in the constable’s company, but any hardship today would be worthwhile if they caught a necromancer. “I don’t think it works like that,” said Roger. Truthfully, Roger worried that he didn’t really know how any of it worked. The books he had read only told part of the story and left him with questions that he couldn’t find an answer to. During his informal studies he had grasped some basic principles, and for a moment he even thought about explaining that they were looking not for a witch but for a necromancer, one who summoned evil spirits, and that not all magic was witchcraft. But looking at the constable’s squat thick skull he decided he would be wasting his breath. Constable Will pointed up the alley. “There’s a crack in the fence here, let’s see if anything’s going on.” The constable shuffled his ungainly body along the wooden fence and beckoned for Roger to follow. The fence was in need of repair. It had a large crack where a board had fallen away through which they could get a view of the backyard. “Poop poop,” went something that sounded like a bird. “What can you see?” asked Roger. “There’s a woman and she’s got this funny orange bird in her hand, talking to it. Can you hear?” whispered the Constable. “No time for that,” said the constable. He shoved Roger aside, raised a heavily-shod foot and kicked down the flimsy fence that hid them. “By the saints!” said the constable. “It’s Margery Haukwake. The Abbot is just going to love me when I bring you in.” As he laughed, his head rolled on his thick neck with pleasure. With most of the fence gone, Roger could see the whole of the backyard. The woman had turned round, an expression of disbelief on her pretty soft face. The same face he had been admiring everyday for almost a year since he started as chantry priest at St. Peter’s church. On her hand perched a brightly-coloured orange bird, a fan shaped crest jutting from the top of its head. The bird looked at the newcomers with nervous enquiry. “Your big house on the market square not good enough for you Margery?” said the constable. “Your father would be interested to know about this wouldn’t he? Do you bring men here?” The constable stepped towards Margery and tried to grab her arm. She spun on her heel and moved towards the back door of the house, the bird, still perched on her hand, fluttered its wings slightly but otherwise remained still. “I’ll forget what I saw and heard though, if you give me a peck on the cheek,” said the constable. Roger stepped forward into the yard. Margery‘s red lips twisted in anger. Roger began to stutter an answer, but the constable spoke first and louder. Roger gulped down a chunk of vomit at the back of his throat, as he thought about gruesome Constable Will with his beloved Margery. He wanted to lash out at Will, but panic stopped him. Now Margery turned her anger on him. “I made a mistake, I don’t mean to offend. This has all been a terrible mistake,” said Roger. “Well…” Roger tried to think of what to say. The sale of a special creature like a hoopoe was the evidence that he had been hoping to come across for a long time. He had thought that at last someone in authority would take notice of the evil sorcery happening in St. Dunstan’s. Then, at that moment, Margery raised her hand and threw the bird into the grey sky above. The bird, surprised at its sudden release, took a moment to open its wings, but then flapped them hard with slow deliberate strokes and propelled itself up into the air. The black and white stripes of its wings were soon high above the three people standing in the backyard of the house. “What are you doing, that’s evidence!” shouted Constable Will. “It just took off, I’m not its owner,” said Margery. “The bird must have escaped from somewhere and flown here. I was just feeding it. There’s no crime against that, is there constable?” Margery’s voice was less angry now. She smiled at Constable Will. Margery’s nostrils flared and she cast a hateful glance at Roger. He felt like his heart had caved in. How could he ever win her love now? “You stupid soft puppy,” said the constable. He swung his club above his head hard and fast. Roger ducked to one side, but the hard wood still caught him a glancing blow on the shoulder knocking him sprawling to the ground. He was face down and he couldn’t lift himself up. Through ringing ears he could hear the constable speaking. The constable’s words came to a stop with a dull thud. Roger looked up to see a man holding the constable’s body from behind and gently laying it down. The constable’s eyes flickered for a moment and then, giving up consciousness, shut.